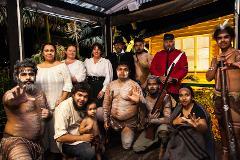 Australia's newest and most spectacular interactive Aboriginal Live Theatre Show & Dinner Experience located halfway between Gold Coast & Brisbane. Includes: Transfers; Live moving theatre show, 3 course dinner and dessert. A 'Welcome to Country' is where the traditional Aboriginal owners welcome people to their land at the beginning of your external event or ceremony in Yuggera and Yugembeh Country. 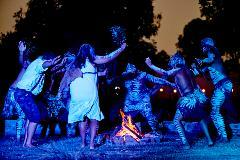 A didgeridoo performance accompanies this welcome. Let Spirits of the Red Sand bring the entertainment to you with a Traditional Aboriginal Cultural performance combining a Traditional Welcome to Country; didgeridoo; interactive cultural stations and a song and dance spectacular. Enter the world of the Aboriginal as you journey with your Elder through Dreamtime, and spend time at interactive cultural stations learning all aspects of traditional Aboriginal life.